Many know the saying “Pride cometh before a fall”, but what happens when you hit the ground? This is the concept that intrigued Humble Beast artist JGivens to create his latest album, Fly Exam. When reflecting on the heights that our ego and pride can reach, we are inevitably going to fall from our lofty position. But what intrigues JGivens is: What then? If our pride leads us up to the stars, gravity will pull us down – but what happens when we reach the bottom? Will we crash and burn, or will Christ rescue us from our fate? Fly Exam is an insight into the human heart, and the nature of pride. JGivens explores this subject in a very multifaceted way – he doesn’t only share his own experience or teach concepts, he unpacks intricate and extended metaphors, analyses themes and ideas, and shares the hope of Christ in the midst. From the first track and first single, Ignorantro, it is easy to tell that JGivens is a master lyricist. He shares an aggressive verse attacking the pride that is normalised within mainstream hip hop music. It is brilliantly clever and masterfully executed. I really highly recommend watching the music video too – it is a masterpiece, almost more of a short film. Perhaps my favourite metaphor he shares in this track, “Get your raps up… with every simile, metaphor, imagery, pattern and the description of the persona we’re witnessing, as if these things aren’t just elephants sipping tea, in a studio apartment we’re starting a sipping spree.” Despite talented lyricism within mainstream hip hop, JGivens acknowledges that it doesn’t cover over the filth much of the music and culture promotes, an ‘elephant in the room’. JGivens keeps building and building, aggressively asserting his lyrics until he begins to assert himself in a great mockery of pride, “If I were you, I would be your favourite rapper, and your favourite rapper’s favourite rapper, the rapper that every rapper’s afraid to rap after”. Ignorantro ends with a highly dramatic crescendo – what seems to be a devastating plane crash. His pride leads to his destruction and downfall. Each track is well crafted by some of the best producers in Christian hip-hop, including Daniel Steele and Courtland Urbano. It has the feeling of many hours of almost hand-crafted labour, and each music video released is also a testament to the evolving artistry in CHH. 10, 2 Get in feat. Odd Thomas is another example of this. It is an eerie track that recognises the tendency of humans to take pride in wealth, rather than trust in God. JGivens addresses this problem, “Abraham had many many sons, many sons had many many sins…” But all of our sin is dealt with in Jesus, “One Son had none but he hung that 10 to get in.” What blew me away even more with this song was again the music video. I had never seen a 360 degree music video before! Fly Exam is full of musical and lyrical gems. Musically it is arrayed with eerie alternative hip hop sounds and intricate Christ centred lyricism that is signature of Humble Beast’s music. JGivens also shares many intimate personal stories of his own struggles with pride and the ways it manifests itself in his life. March 10th and a Third feat. Braille, one of the last tracks on the album, summarised for me the message of the record. Braille shares, “I was falling to my death but before the sun set, the Son stepped in my place, the one who gave me breath took the fall so I fell, in the palm of his hands, and I fell to my knees and surrendered my plans, now I’m close to the sun, walking in the light, waiting for the day when my faith turns to flight”. This is the hope we have in Jesus. As a drawback, JGivens’ lyrical gift is also a weakness – his lyrics are so cryptic, I sometimes struggle to understand the meaning of more than a few phrases per song. I trust his judgment as a writer, but I wonder if he might sometimes be writing so cryptically in order to build an image as a certain kind of artist. But I trust that what he writes, he does so intentionally with personal conviction over all of his lyrics. However, I believe sometimes simple truths can speak volumes more than cryptic ones. Overall, Fly Exam is a work of art. It is an intricately crafted album from start to finish, in production and content. However, like most art, it is an acquired taste. If you’re up for it, you could spend hours dissecting his lyrics, discovering new layers every time. If you give the album a listen, like a good bottle of wine, take time to mull it over for a while. I give Fly Exam four out of five stars. 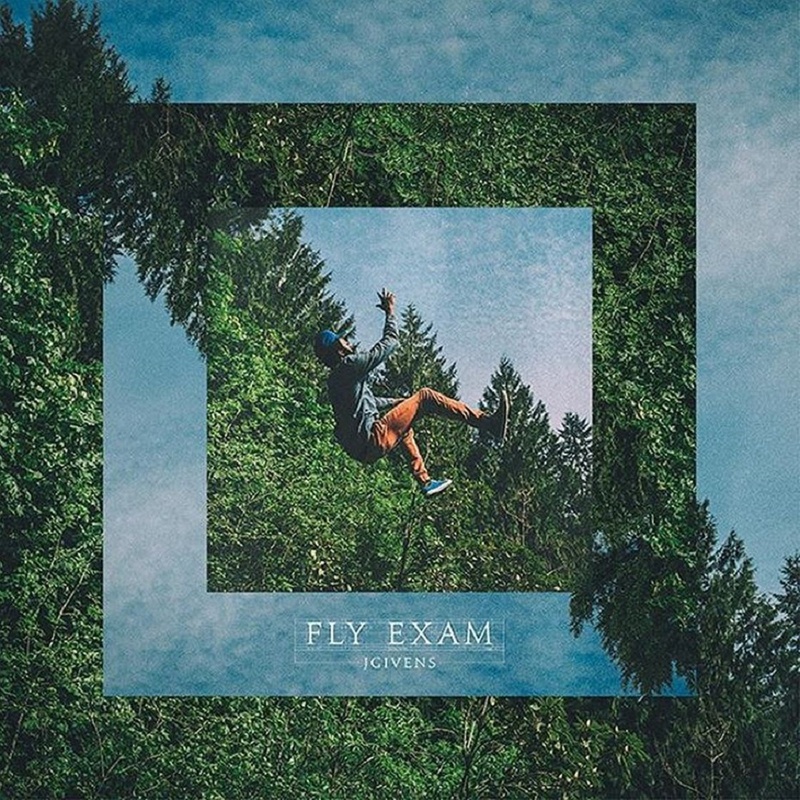 Fly Exam by JGivens is available now on iTunes, and as a free download at Humble Beast. Hear our interview with JGivens about Fly Exam here. Posted in MusicTagged Album Review, christian, Fly Exam, Humble Beast, J Givens, JGivensBookmark the permalink.